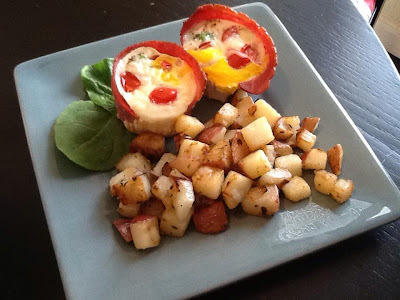 The Writers Alley: What’s for Brinner? Mmm mmm! The nerve of those poor misguided folks who think delightful culinary treats like omelets, bacon, pancakes, waffles, fried potatoes, cinnamon rolls, and biscuits and gravy (to name a few of my favorites) are only allowed to dazzle in those dreadful morning hours. But the problem is, most often to do breakfast up right, you are juggling three or more different preparations, orchestrating like a frantic maestro to get everything done and hot at the same time, and then you’re left with a huge mess in the kitchen. This is my super simple solution to a delicious and painless Brinner that will satisfy every appetite. Mega healthy! And it’s pretty... so it's great for entertaining too! 12 Paper cups for cupcake tin. Preheat your oven to 350. Line your cupcake tin with paper cups for easy clean-up, or coat with non-stick spray if you prefer. To start out, curl a piece of turkey bacon around the inner edge of each cup (inside the paper liner.) After that I like to also use an extra piece, tear it in thirds, and pop the little scrap on the bottom of the cup so there is bacon on every side. Then crack one egg in each cup, and poke the yolk with a fork. Top with your favorites. For this recipe I use a sprinkle of diced green onion, one (quartered) grape tomato, and a pinch of goat cheese, feta, or a shredded cheese mixture like Colby-Jack over each egg. Or mix-and-match if you like. Salt and pepper those babies and pop 'em in the oven for about 20 minutes, until the egg is fully set. Easy meal, easy clean. Happy family. And happy mama who can get back to work writing that masterpiece! Bon Appetite! PS... If there are any left over, they are GREAT reheated the next morning!!! I’m curious: What’s your favorite food for brinner? I'm going to try these.